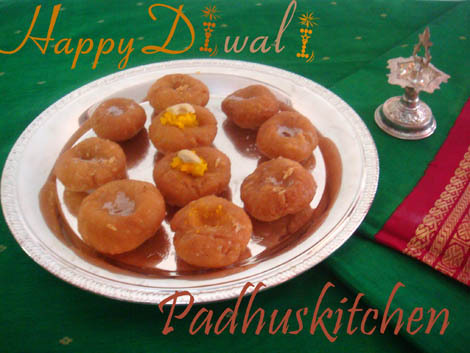 Badusha is a famous South Indian sweet made with all purpose flour and sugar. It is usually made for Diwali. 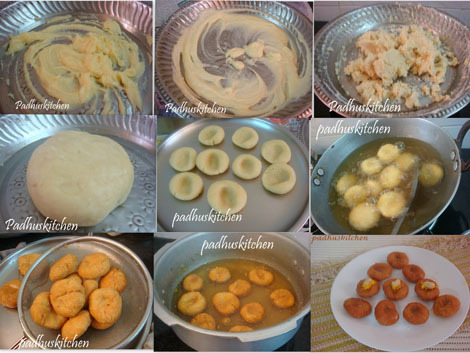 Today let us learn how to make Badusha using this easy step by step Badusha recipe. Seive maida and keep it aside. First mix dalda, cooking soda and ghee nicely / vigorously for 10 minutes. (pic 1 and 2).Do it in the same direction. Then add maida and mix well with your hands. Add water little by little and knead it into a soft dough. (I added around 1/4 cup and a little more water)(pic 3 and 4).This step is very important to get soft badushas. Let it sit for 15 minutes . Take a pan, add water and sugar and bring it to boil. Add milk and boil for a few more seconds. The impurities (if any) in sugar will come to the surface. Remove it with a ladle. Then boil sugar syrup till it reaches one string consistency. Add cardamom powder and pachai karpuram. If needed, garnish with grated coconut and cashew nuts on top while serving. To check whether the oil is hot, drop a little batter into the oil, if it rises immediately to the surface, then it is the right temperature to add the prepared badusha. You have to keep the flame in low while frying the badushas. If the temperature of the oil is high, the badushas will turn golden brown fast but will remain uncooked inside. To know what is one string consistency, refer my Boondi laddu recipe. If the dough gets too soft, do not panic, just add more flour to set it right.This will stay fresh for a week .You can store it in an air tight container. 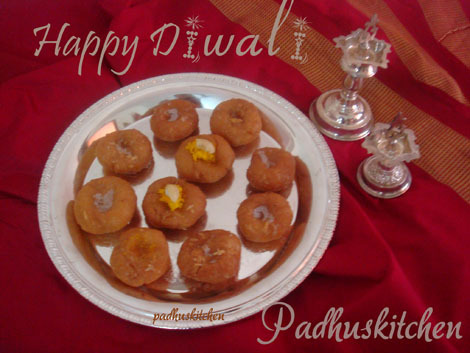 Enjoy this Diwali by preparing this yummy and delicious Badusha. Meet you all again with more interesting recipes and tips, till then stay tuned. Deliciously done Balushahi luks tempting. Wow!badusha looks so delicious and tempting. never tried badusha at home Padhu. This looks soo good. I gotta try this one at home after my exam.Sounds good. Wow!!! looks very divine and tempting. Padhu, Badushas look perfect..and love ur presentation..Very festive. The step by step pictorial presentaion will make it so easy to follow. Well, either you did not knead the dough properly or the oil was not hot enough.That might be the reason why your badhusha broke while frying. The first step (ie)" mixing dalda and ghee nicely for 10 minutes.Then add maida, cooking soda and mix well" is very important to get soft badushas. Mix vigorously or beat for nearly 10-15 minutes. You can use hand beater also or use your hands. Hi, I'm planning to prepare Badusha tomorrow for this yr Diwali...I dont have Dalda..Wht can I use instead of Dalda? You can try replacing it with ghee but I have not tried using ghee fully. So I do not know how the outcome will be. What do you think went wrong??.. Hi Padu Madam... If we want to avoid Maida, any other floor that you suggest Pl? Baudsha is made only with maida. You can try some other diwali sweets if you want to avoid maida. Is the sugar to be measured in cup or kg ? Sugar is 3/4 kg . Yes just 4 tbsp milk is added to syrup to remove the dirt and impurities in sugar. I am trying badhusha but when I fry it's all coming out. .It's not holding together. .what to do. For Badusha not holding together -If the oil is not hot enough, it happens. Oil should not be too hot also.